First tutorial of 2011! These napkin rings have been on my to-do list for over 6 months but I was a little busy with Christmas so I am finally getting around to them. Poor Finn is loosing a craft room toy. They have been cut and on my shelf forever and he loves to play with them. Maybe I will make him some more? 1. Cut your PVC pipe into 2″ sections. My PVC pipe was 1 1/2″ in diameter. My husband controls the power tools over here so mine magically showed up in my craft room, cut perfectly! I asked him to cut 10 for me. 2. I wanted my napkin rings to look “foodish” so I used a Martha Stewart Whole Living magazine, they have really clean, pretty pictures. You can use whatever magazine or paper you like; newspaper, a book, fashion mag, an old map, scrapbook paper… get creative. 3. Go through and rip about 10-12 pages that are interesting to you. I looked for bright colors, cool bold words, and recipes. 4. Cut them into 2″ x 7″ strips. Cut them from the middle of the paper so you get interesting parts of the pictures. Pick out your favorite strips and set them aside. 5. 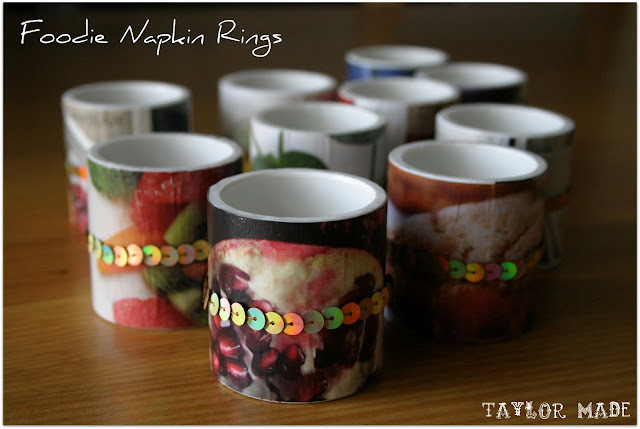 Apply a thin layer of Mod Podge (I’m using matte finish) to a napkin ring. Carefully place the strip of magazine into the ring. Gently smooth out the paper as you go. There will be a little excess paper just add a little Mod Podge underneath so it sticks. Do this to all the rings. 6. Once all 10 strips and rings have become one, we are going to apply the 1st topcoat of Mod Podge. There will be some air bubbles so just smooth them out with your fingers first. This layer should also be thin. Wait about 15-30 minutes for this coat to dry. 8. This step is optional: I am going to add a little pop to my napkin rings with a sequin ribbon. You can embellish with any ribbon or buttons or whatever you have. I cut my ribbon into 7″ sections. Glue them on with Elmer’s Glue and wait a few more hours to dry. These babies will really add some pop to your table! If you are like me this makes you want to host a dinner party now. Happy Hosting! Thanks for auditioning for American Crafter! This is such a fun idea! I’ll be linking on my first “Show & Share” post on Thursday. Please stop by and grab a “Featured” button!